Total Computer DJ in a Box is the perfect way to get started DJing today. The kit gives you everything you need to DJ using your computer. Mix and scratch on Total Control, the scratch control surface designed expressly for computer DJs. DJ|iO gets audio into and out of your computer for connection to the PA system and for cueing with the included pro-grade HF125 headphones. 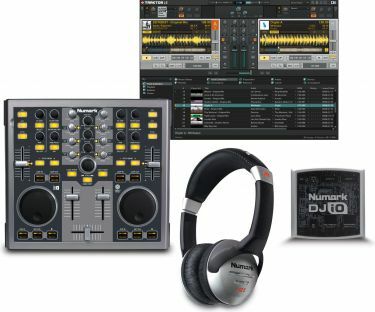 Total DJ in a Box even comes with Traktor LE heavy-hitting DJ software from Native Instruments. Total Control is laid-out just like a DJ mixer or CD player, with scratch wheels, line faders, EQ knobs, and a crossfader, so it's easy to jump to any other DJ's system. 31 buttons, 20 knobs, and five faders give you power at the gig. And it's USB-powered, so you're not chained to a wall outlet. Total Control uses MIDI so it's compatible with most DJ software, and it even comes with pre-mapped controls and an overlay to work directly with Traktor LE with no programming needed. DJ|iO is a compact, rugged computer interface that gets audio into and out of your computer on an easy USB connection. It has a mic input, two sets of RCA outs, and a headphone jack to handle all of your audio system connections. CD-grade 24-bit, 44.1/88.2 kHz audio powered by ultra-low-latency ASIO drivers gives DJ|iO the high-quality sound you expect from Numark. Without a great pair of headphones, rocking the house is really tough. That's why Total Computer DJ in a Box comes with HF125 DJ headphones. You'll be thinking "My Mic Sounds Nice" when you hear your jams through these killer cans. 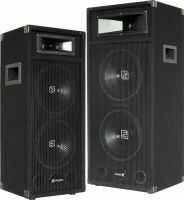 HF125s feature seven-position adjustable earcups housing large 40mm mylar speaker drivers, a six-foot tangle-resistant cable, a padding on the headband and earcups. Turn on, plug in and rock out tonight with Total Computer DJ in a Box.